Did you spend the weekend refreshing your Twitter account awaiting Hillary’s announcement like we did? With less than 140 characters and a killer video, Hillary Clinton became the first Democratic presidential candidate to enter the race for 2016 by declaring “I’m running for president”. In a video pitch aimed at middle class Americans, she stated that “Everyday Americans need a champion, and I want to be that champion”. Clinton, has used the c word (champion) in a bid to let her potential voters know she is a ‘normal’ woman wanting to lead every-day American’s to a brighter future; to put it simply she’s in their corner! How she is received — and how she performs when reporters and voters mob her after a seven-year hiatus from presidential campainging — will tell much about the campaign journey ahead. But her enemies are waiting for any hint that she’s too out of touch to connect, even referring to Clinton as the Grandmother-of-State. Hillary is using the word champion and also drawing on her own middle class upbringing to keep the spotlight off her current wealth and normalise herself to the everyday American citizen. “Her mother’s own childhood — in which she was abandoned by her parents, taught Hillary that every child deserves a champion … that continues to be her core motivation,” read the talking points distributed to media soon after the video was released. They also added, “After law school, Hillary chose not to go to a big New York or Washington law firm. Instead she went door to door in New Bedford, Massachusetts, for the Children’s Defense Fun”. 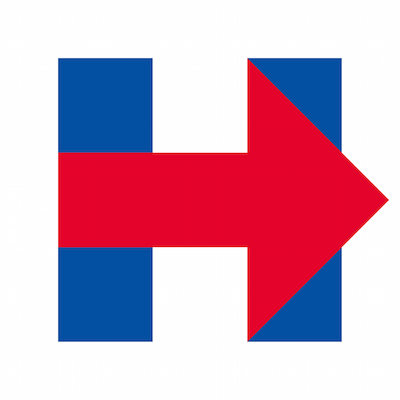 Hillary Clinton’s new campaign logo, which shows a red arrow pointing towards… the future? the movement of change and progress?) superimposed over the letter “H” has been a massive talking point already. Many studies have shown that a company’s logo is one of the most important aspects of marketing and advertising a brand, or features that distinctly identifies a company’s product or service from its competitors. 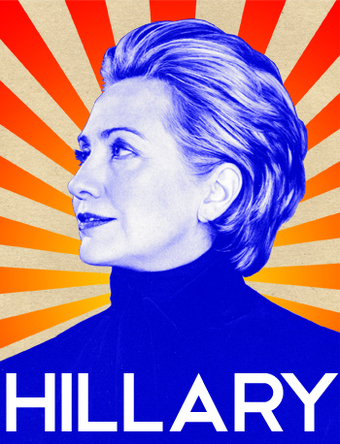 The colours chosen in Clinton’s logo identify with empowerment, confidence and trust. These are important element of any brand, but a must for a presidential nominee. We’re looking forward to watching this campaign which officially kicks off in May. In our eyes: Hillary you’re a champion and we hope you win this race. Hillary is also embracing social media, and we’ll be watching closely – and no doubt we’ll all be upping our intake of Chipotle given Hillary’s recent incognito dining experience, which compared to Bill’s visits to McDonalds in the 90s shows Hillary is a healthy, modern woman!